Sandoval Lake is amongst the most popular destinations for visitors to Tambopata due to the abundance of Amazon wildlife that inhabits it and its easy access from Puerto Maldonado, the nearest town, and the jungle lodges dotted along the Tambopata and Madre de Dios rivers. It is a large oxbow lake of approx. 3 km (1.8 miles) long, 1 km (0.6 miles) wide and 0.5 – 3 m (1.6 – 9.8 ft.) deep and is surrounded by an extensive swamp forest where Mauritia flexuosa palm trees, also known as Aguajales, grow and create an extraordinary landscape. These trees grow up to 30 m (nearly 100 ft.) tall. Around the lake you’ll also see beautiful orchids, kapok trees and mahogany trees. Visitors are paddled around the lake on non-motorised canoes with guides who will point out and give explanations about the wildlife and ecosystems in the area. 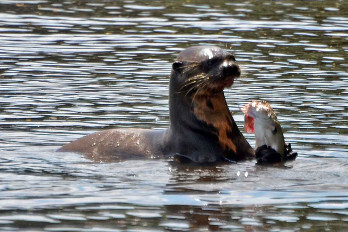 Sandoval Lake is best known for being home to a family of the critically endangered Giant River Otters who are often seen hunting for fish in the lake, frequently in small groups. They are relatively easy to spot because they tend to spend a large part of the daytime in open water. 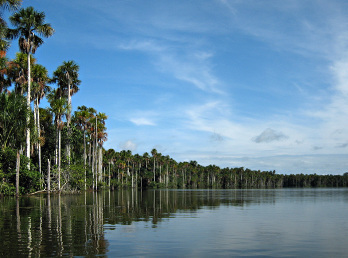 The lake and the surrounding swamp forest also provide habitats for an incredible variety of other wildlife such as six types of monkeys, a great variety of Amazon birds such as macaws, toucans, parrots, and the prehistoric-looking Hoatzins, anteaters, tapirs, turtles, Black Caimans and many more. Note: Giant River Otters are highly endangered and sensitive animals. You will be asked to remain on your seat in the boat, not to talk above a whisper, especially while they are less than 100 m (330 ft.) away, and to not use flash photography. Sandoval Lake is located within the Tambopata National Reserve, south-eastern Peru, and is 14 km from the nearest town, Puerto Maldonado. You can book flights to Puerto Maldonado from Cusco or Lima. Visitors take a motorised boat from the town (30 minutes) or from their lodge and then walk a 3km (just under 2 miles) trail from the river shore through the forest, stopping on the way to admire the native orchids and other plants, birds, butterflies and if they are in luck, see rainforest animals. The walk can take between half an hour and two hours depending on how muddy the trail is; some travellers that prefer not to or cannot walk so much order a rickshaw transfer service. At the end of the trail, visitors are paddled through a narrow canal on a small non-motorised canoe until they reach Sandoval Lake itself (approx. 15 minutes). Most visitors stay in one of the Amazon rainforest lodges along the Madre de Dios or Tambopata River and are taken by their own accommodation’s guides or a certified, independent guide, normally as part of a wider itinerary in Tambopata. Other options are staying at the Sandoval Lake Lodge or the Mejia Lodge, which are on the lake itself or staying at a hotel or hostel in Puerto Maldonado and coming on a tour.